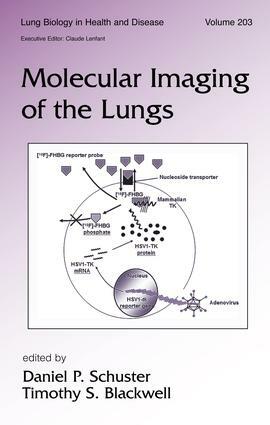 This authoritative reference reviews current and emerging molecular imaging modalities that are expected to impact the detection and treatment of lung diseases in the near future-including applications in gene expression and inflammation imaging; the imaging of pulmonary cytokine regulation; the molecular imaging of angiogenesis, the airways, and lung cancer; and the imaging of cellular death and cell trafficking. Methodologies. Molecular Imaging Probes for PET and SPECT. "Micro"-Instruments for Molecular Imaging with PET and SPECT. PET and SPECT Imaging. Imaging Cellular and Molecular Processes in the Lung Using Bioluminescent Reporter Genes. Magnetic Resonance Imaging. Imaging the Mouse Lung with Micro-CT. Multimodal Noninvasive Imaging Strategies to Visualize Tissue-Specific Gene Expression with Transcriptional Amplification Approaches. Application to the Lungs. Gene Expression Imaging in the Lungs. Inflammation Imaging in the Lungs. Bioluminescence Imaging of Transcription Factor Activity in the Lungs. Molecular Imaging of Lung Cancer. Molecular Imaging of Protein-Protein Interactions in Living Animals. Functional Imaging of Cellular Death. Imaging Cell Trafficking. Imaging Angiogenesis in the Lungs. Molecular Imaging of the Airways. Functional Imaging of Rodent Lungs. Prospects for Molecular Imaging in Humans.